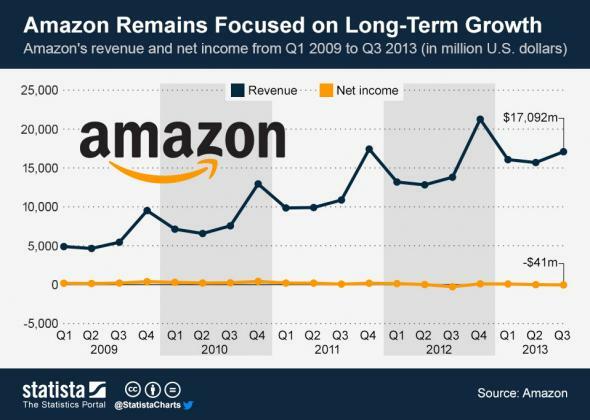 If there is any doubt about whether the internet is changing how we do business I think it is best summed up in the above chart from Statista.com, which highlights both how Amazon continues to grow its sales while simultaneously losing money. The point here is not to criticize Amazon’s business practices. Its an enormously successful company, but its share price has continued to grow in the face of declining revenues. What other company could operate like this outside of the internet? Apple, who I’ve written about before, is uniquely profitable but is frequently criticized for not growing enough even while it crushes its competitors. The other way to look at this is whether Walmart would be given similar considerations? Amazon is spending and investing everything that they make, and in the process some of those investments run at a loss. This is good for us, but its rare that the market rewards companies who ignore the shareholder so entirely for the sake of the consumer. The question of what effect the internet is having on business only gets more confusing when you find out that Pinterest is valued at 3.8 billion with zero revenue and Twitter isn’t expected to make a profit until 2015.